MGM loves stories that confirm the American Dream is still alive and well. Case in point, boyhood friends Bernie Fay and John Ferraresi combined forces in 2016 to own and operate The Most Important Stretch in Golf device. And the best part of this invention — it’s simplicity of use. All you have to do is push up the sliding handle along the shaft and you will feel a tremendous and wonderful stretch in the shoulders, back and hips. The MISIG for short will dramatically increase degrees of back swing and range of motion. We were fortunate to interview MISIG’s founder Bernie Fay and he offeres his insights on this do-it-all product! 1) Please fill our readers in on the interesting story behind the creation of the Most Important Stretch in Golf Device? When I was 12 years I had a compound spiral dislocation of the humerus in the left arm (the bone from the shoulder to the elbow broke in half). Today it is arthritic. This is how I came to invent the “Most Important Stretch In Golf.” I was in my garage doing various stretches for my shoulder and nothing was giving me back my range of motion. I saw a bungee cord on the work bench. I tied the bungee cord just above my left elbow in a knot. By pulling up and away with the bungee cord I felt a nice stretch in my bothersome shoulder. I then went upstairs and got an ankle brace and slid it up my arm because the bungee cord was too tight. I bunched up one side of the brace and hooked the bungee cord to it. When I pulled up and away I got so much relief!! 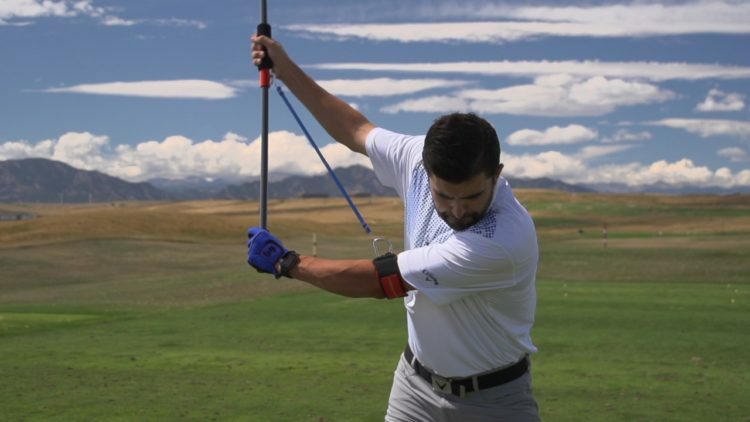 I started to think how I could make a device that would put this idea into a real tool for stretching the shoulders, back and hips in a golf swing motion. I honestly believed I could help a lot of golfers with range of motion and game improvement. After a lot of trips to the hardware store and ordering various parts I developed a prototype out of PVC pipe, nuts, bolts and surgical tubing. The first prototype was ugly but it worked! After speaking with my family, we decided to put in for a patent application. Using the MISIG as a swing trainer came when I started to show it to golf instructors. The all had one common thought; “This is the back swing motion I try to teach my students every day. Elbow Locked Through extension, wrist hinged properly and very effective shoulder turn. Using the MISIG as an exercise device came from physical therapists and there are a lot of them using it as a golf rehab and exercise tool. I made MISIGS in my “little warehouse” as I like to call it for the first six months of business and that was hard because a lot of it was in the middle of winter and there was no heat and the small space heater I had did not cut it. It was especially hard on my wife because at the time, she still called it the garage and it was where she liked to park her car (laughing) After that I found a wonderful manufacturing and fulfillment company in Florida. My wife has been so wonderful throughout this entire journey. Finally, here is a brief timeline of the company: I came up with the idea for the MISIG around August/September of 2015. Two months after that I had my patent application in. We started shipping in April of 2016 and our sales are now increasing by a large percent month over month. I’m just glad I’m not making them in my garage anymore! 2) Please discuss the incredible feedback your product has received and how it validates what you are doing? And then there is the story that I think about a lot, almost every day. I tell this story to anyone I can. It’s from a Phil Slaughter who came up to me at the PGA Merchandise Show in Orlando Florida in January. He said one of the main reasons he came to the show was to meet me and thank me He told me that three years ago he was in a terrible car accident. He was in the hospital for a long time. After two years of rehab, he said the doctors told him he would most likely never golf again. This is a man who was retired and golfing was his life every day of the week. He said he saw the MISIG in a magazine and ordered one. Today he golfs five days a week and told me the MISIG was the main reason for that. Stories like that validate the MISIGS’ relevance and legitimize it as a great training aid and also as a great rehab tool. And the proof is in our sales because a large amount of orders come from physical therapists. I think that getting John Tillery, a renowned PGA instructor for some of the big names on the PGA Tour like Brandt Snedeker and Roberto Castro, to make a statement like he did speaks volumes about this device; “The MISIG is a wonderful little training aid. Not only as a flexibility tool, but as a guide to feel the necessary loading and structure needed to produce a dynamic motion.